This morning we awoke to a 40 degree outside temperature, but inside, we are toasty and comfortable. We had breakfast and took a brisk walk outside. We left our campsite around 8:30 a.m. and stopped for diesel fuel outside our campground. The diesel here is $4.70/gallon. 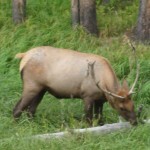 Our experience here in Yellowstone, and particularly the Fishing Bridge Campground has been awesome. 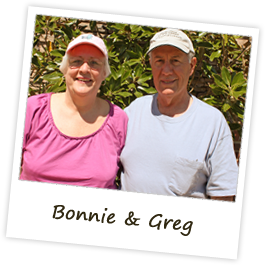 From the moment of check-in the rangers and workers have been extremely efficient and friendly. Everything has gone so smoothly. 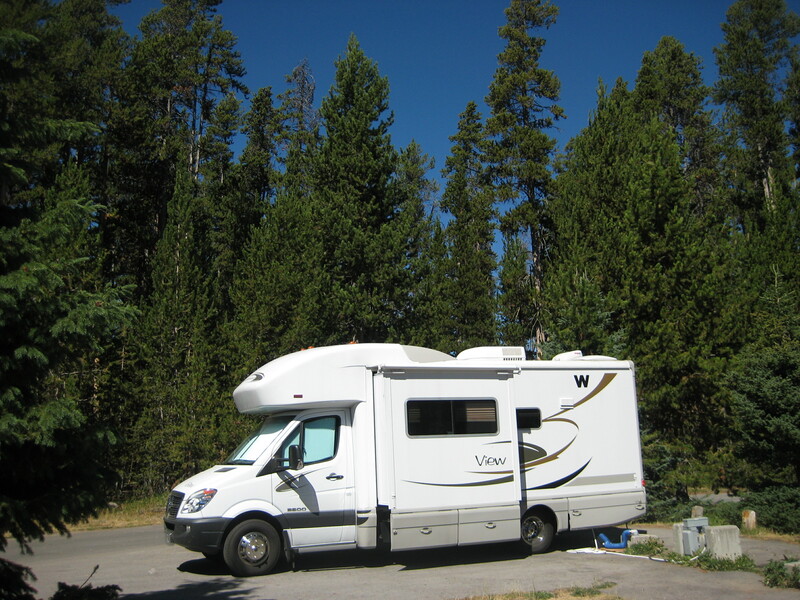 The campground is kept very clean and we just love our location right on the edge of the forest. We keep waiting for buffalo to come out of the woods right beside us because we can see trees that the buffalo have rubbed the bark off. I’m sure there’s a name for this, but we saw the buffalo yesterday rubbing their heads on trees (in the Hayden Valley) until the bark comes off. Anyway, we know they have been in here because of the bark missing from the trees. Also there are other traces of buffalo, if you know what I mean! 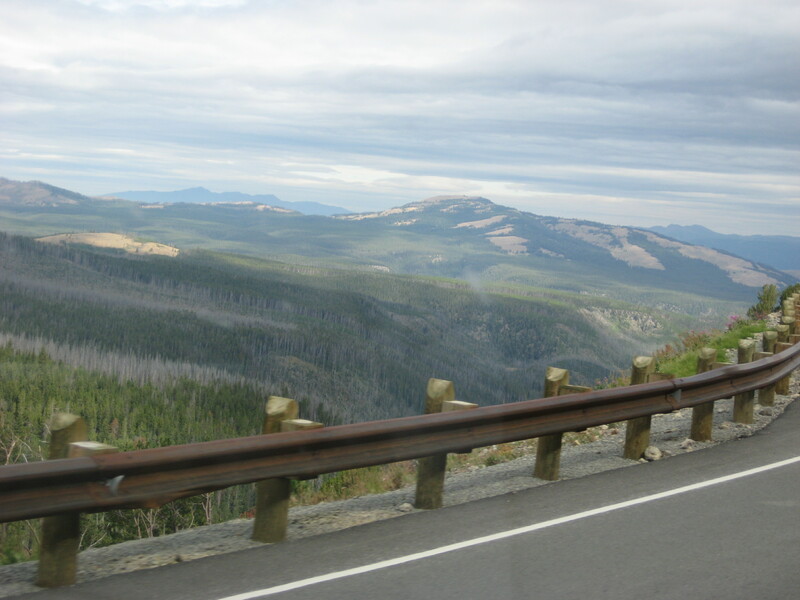 We drove the “lower loop” road today which was more scenery than geysers. 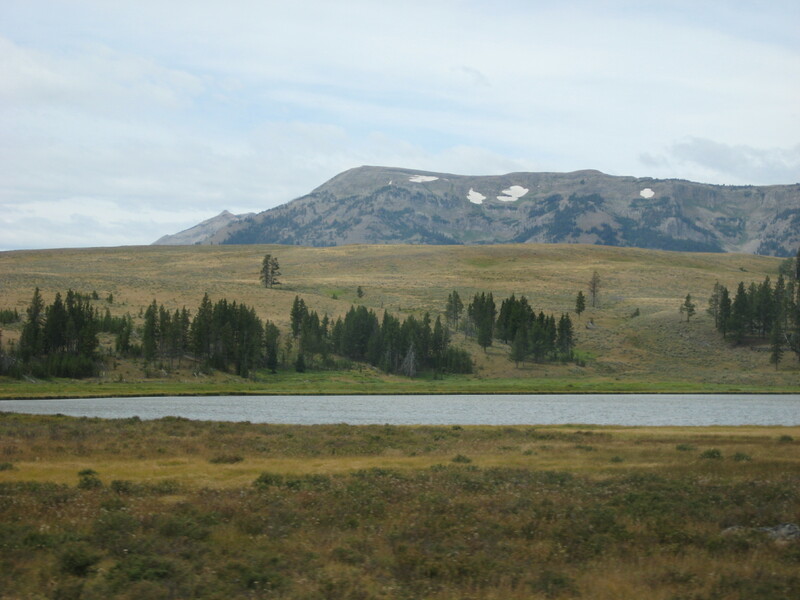 The Hayden Valley was wide expanses of meadows with the Yellowstone River in front and the dramatic mountains behind it. 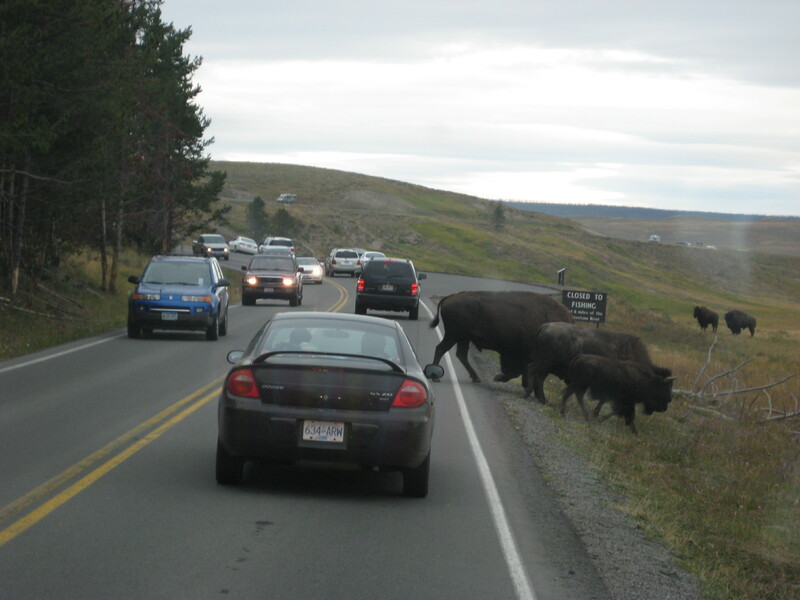 In the Hayden Valley we saw many buffalo herds (literally hundreds of them), some of them causing “buffalo jams”, meaning they cross over the road right in front of vehicles without any thought to being hit by them. And they take their time, so all traffic stops to let them cross. 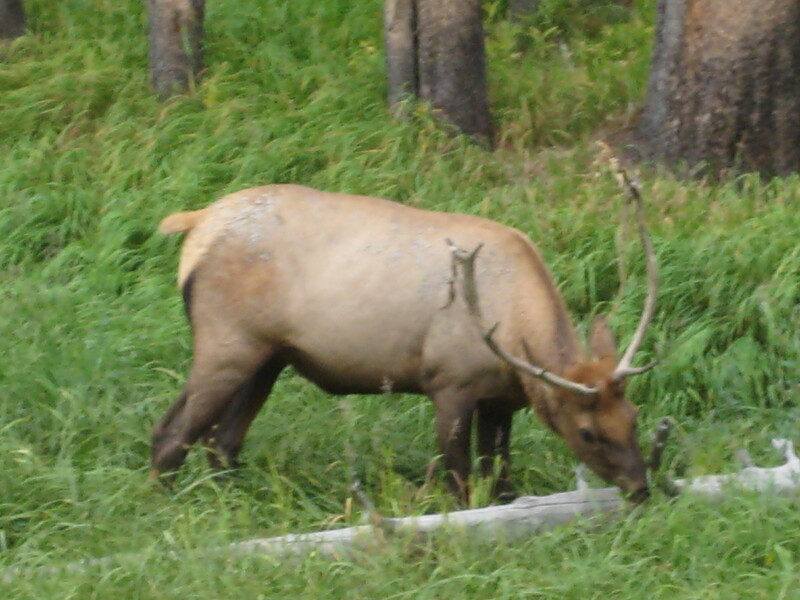 Also we were very excited to see one herd of elk, and a lone elk in the meadow with a huge rack. We got some terrific photos, but we continually say that the photos just do not do justice to the real beauty of the area. 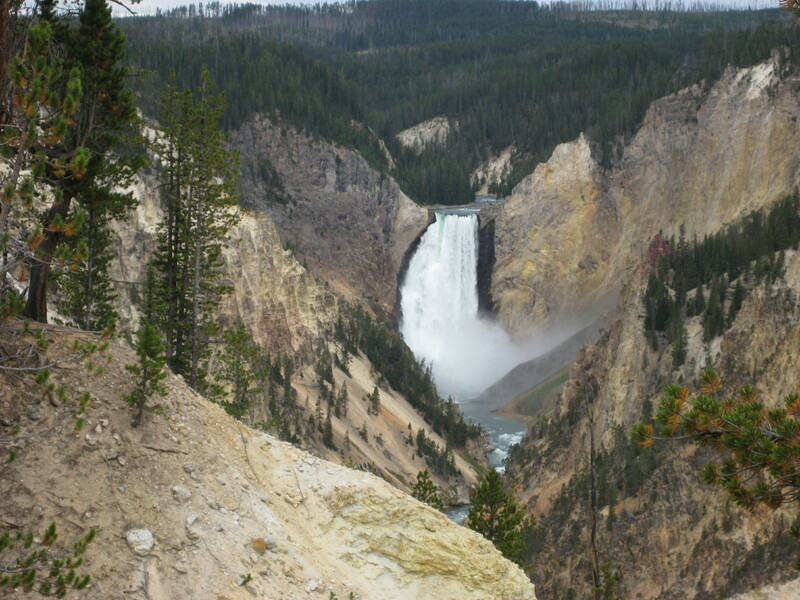 Another beautiful site today was the Upper and Lower Falls in the Grand Canyon of Yellowstone. This is referred to as “Artist Point”, and we certainly think the name is appropriate. 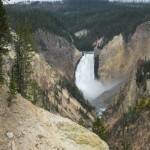 This is a must see of Yellowstone. The canyon is very deep and narrow, and at the end of the canyon is a very dramatic waterfall, hurling water down into the canyon below. It is absolutely breathtaking. We also saw the “Roosevelt Lodge” which was built in 1906 for Theodore Roosevelt. 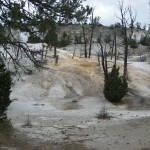 Another interesting site was Mammoth Springs. This is actually a little town with a lodge, housing, restaurant, etc. The attraction here are the Mammoth terraces, meaning the boiling pools are up high, and the landscape terraces down as the water flows over the sides of the terraces. 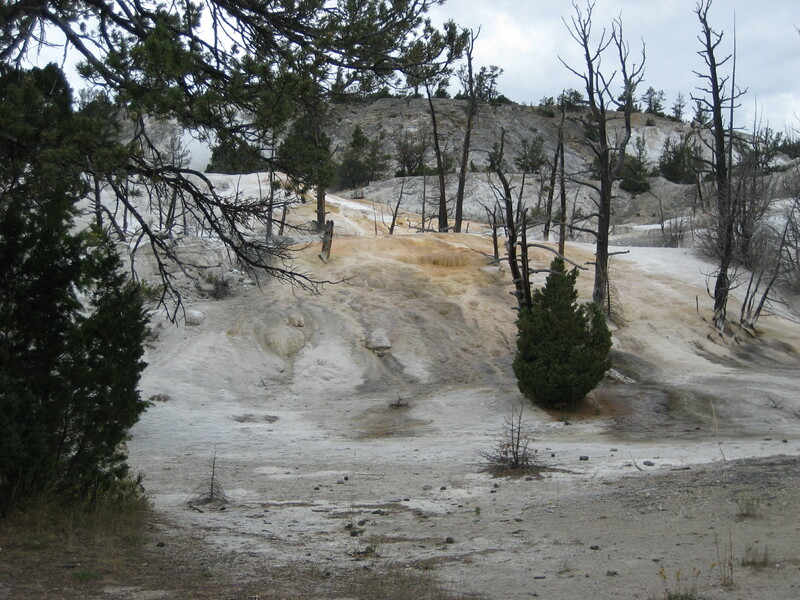 The terraces are extremely white, which made us think of kaolin, or chalk. Many areas of Yellowstone still show signs of the great fire of 1988. Fallen trees are everywhere amongst the new growth of pines. Many wildflowers are growing also. This is a testament to nature’s ability to rejuvenate without interference by man. The new growth is thick and healthy. We arrived back at our campground around 3:00 p.m. today and since the high temperature today is less than 60 degrees, we had a chance to rest and read for the first time we’ve been on this trip. Tonight we are having barbeque pork (from our own smoker). Today is the first day we’ve had clouds but no rain. Although we don’t have cell phone access or internet or television, we do have Sirius radio and we have enjoyed listening to CNN in the evening. 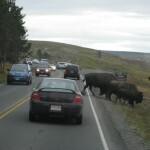 We’ve decided to leave Yellowstone one day early, on Friday rather than Saturday, to give us an extra day in the Tetons. 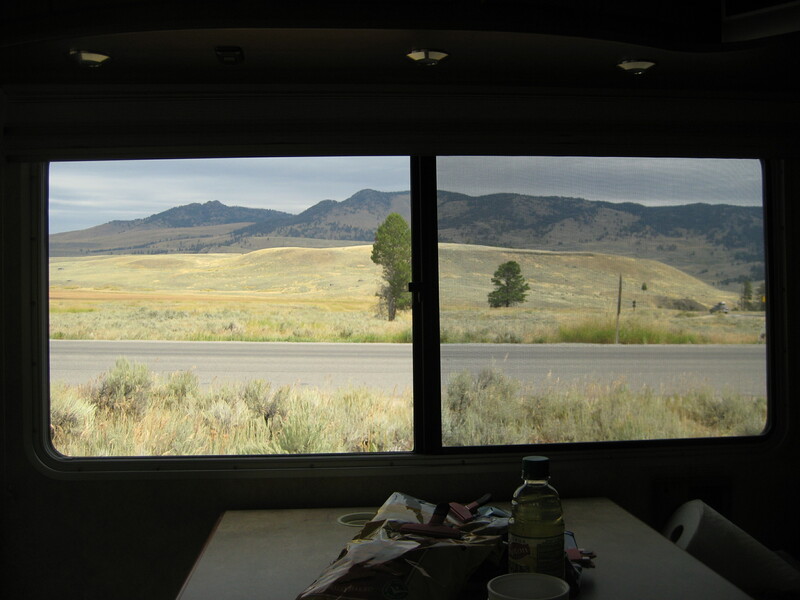 We’ve done everything in Yellowstone that we wanted, and tomorrow we will stay in the campground and do laundry, take walks, read, and just enjoy a day devoted to “doing nothing”. Stay tuned.